Spring is here, or so the calendar says. It snowed all last weekend and now its warming up again. It’s seriously confusing. I want to take out my bright pants and tank tops and go for trail runs and mountain bike rides. Spring also means Easter! I always love celebrating a holiday that revolves around food and getting together with people. My grandparents used to serve lamb on Easter with that electric green “mint jelly” who knows whats actually in that stuff… its weird. This stuffed beef tenderloin is one of my favorite recipes- my mother makes it every year for Christmas but it would make the perfect dish for any special occasion. The combination of Shiitake mushrooms, shallots, and brandy is literally the definition of heaven on earth. 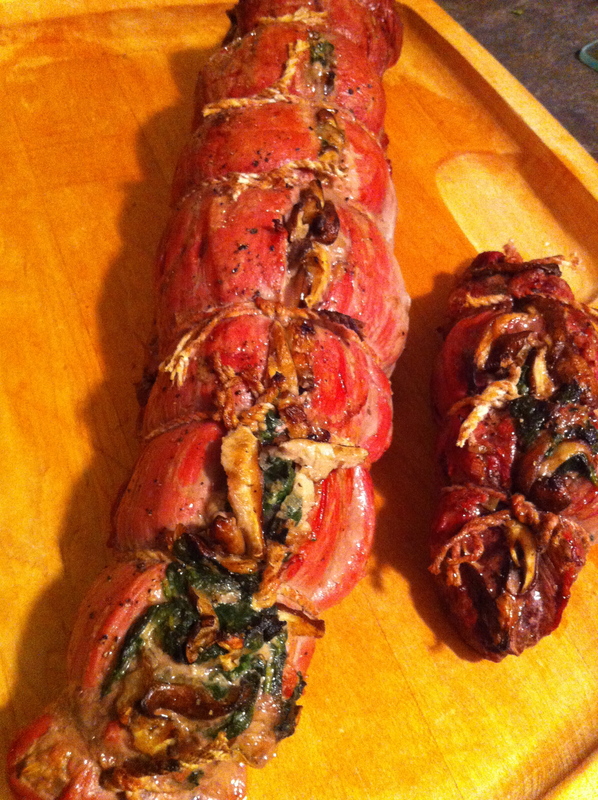 Then wrap that all up in the most tender filet of beef…You get the picture. I usually make this dish with my favorite scalloped yukon gold and sweet potato recipe or celery root puree and finish it with some maple roasted brussel sprouts or absurdly addictive asparagus. That is the definition of a holiday feast- make sure you eat early, you’ll want to savor this meal! You can pick up a trimmed beef tenderloin at the meat counter of your local market or whole foods. 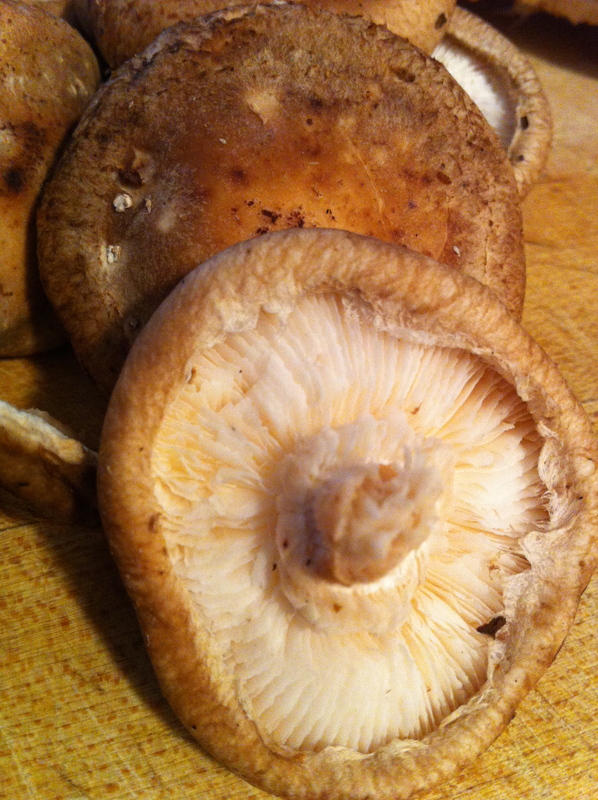 Don’t be surprised when you see its $25 per pound (that is why I only make this dish on special occasions!) but its worth every penny! Make sure you ask the butcher to put some twine in with your cut of beef, you’ll need it to tie the tenderloin together and keep the yummy stuffing inside. Sometimes they’ll butterfly it for you if you ask them to but I prefer to do it myself. If you end up having a smaller piece of beef like we had, make sure you watch it closely so that you don’t over cook it- it will be finished earlier than the larger tenderloin. Whats not to love? I promise you’ll enjoy!! Melt butter in a large nonstick skillet over med-high heat. 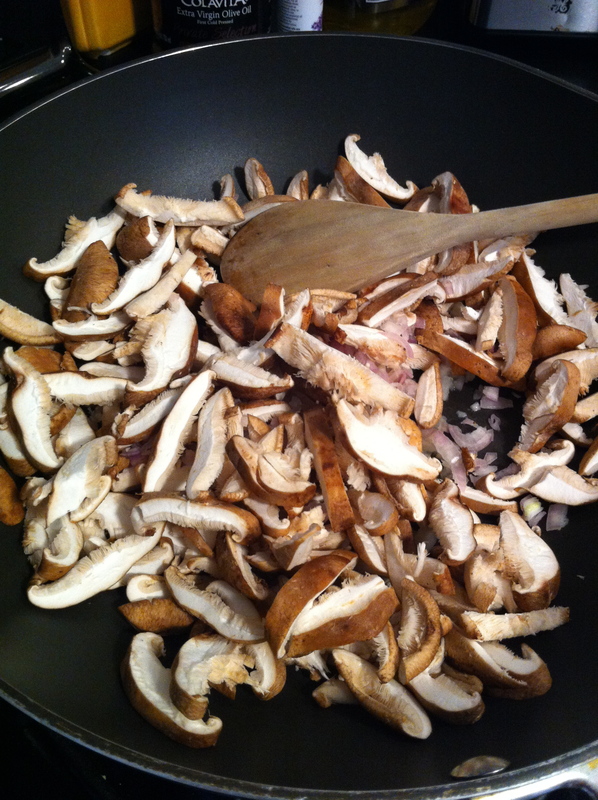 Add the mushrooms and shallots, sauté for 4 mins. Add brandy, cook for 30 seconds or until liquid evaporates. Spoon mixture into a large bowl, set aside. Heat 1 tsp oil in pan over medium heat. Add spinach and garlic, sauté 30 seconds or until spinach wilts. Place spinach mixture in a colander, pressing with the back of a spoon until barely moist. 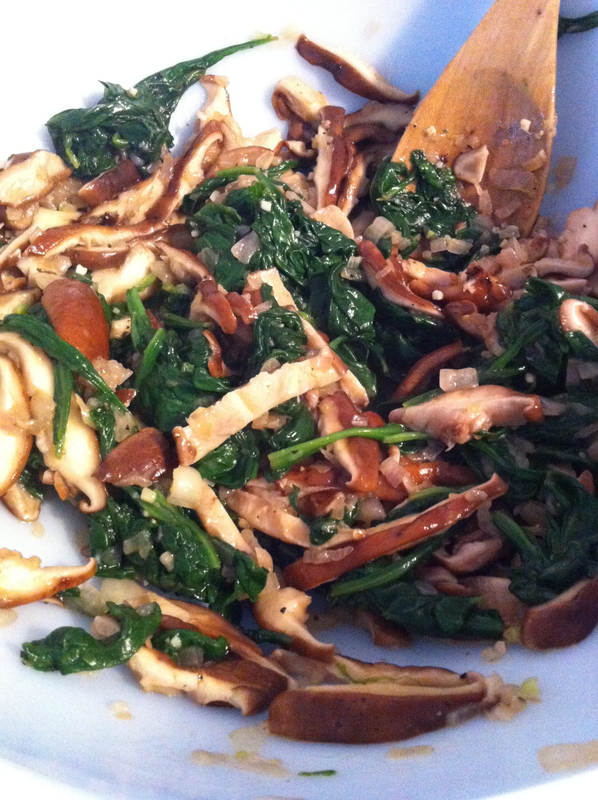 Add spinach mixture, ¼ tsp salt, and ¼ tsp pepper to mushroom mixture, stir well. Trim fat from tenderloin. 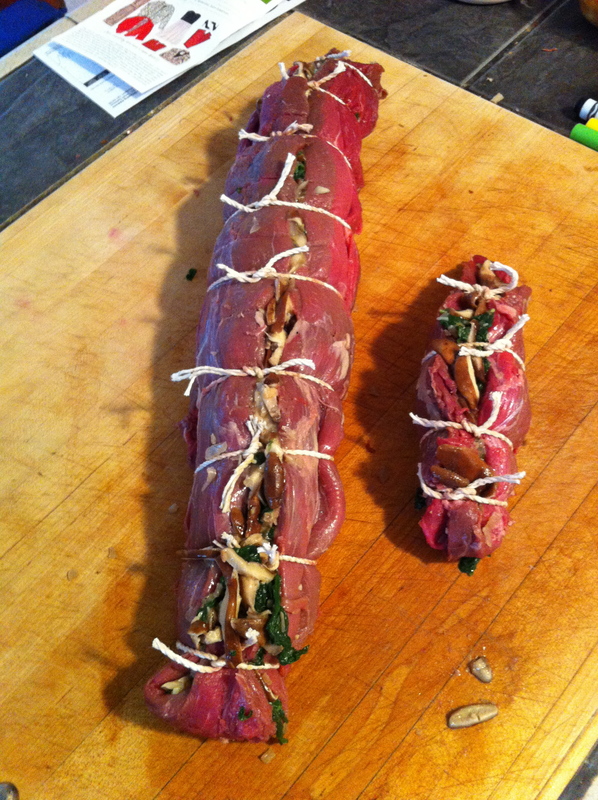 To butterfly tenderloin slice lengthwise, cutting to, but not through, the other side. Open halves, laying the tenderloin flat. Place heavy duty plastic wrap over tenderloin, flatten to an even thickness using a meat mallet or rolling pin. Sprinkle ¼ tsp salt and ¼ tsp pepper over tenderloin. 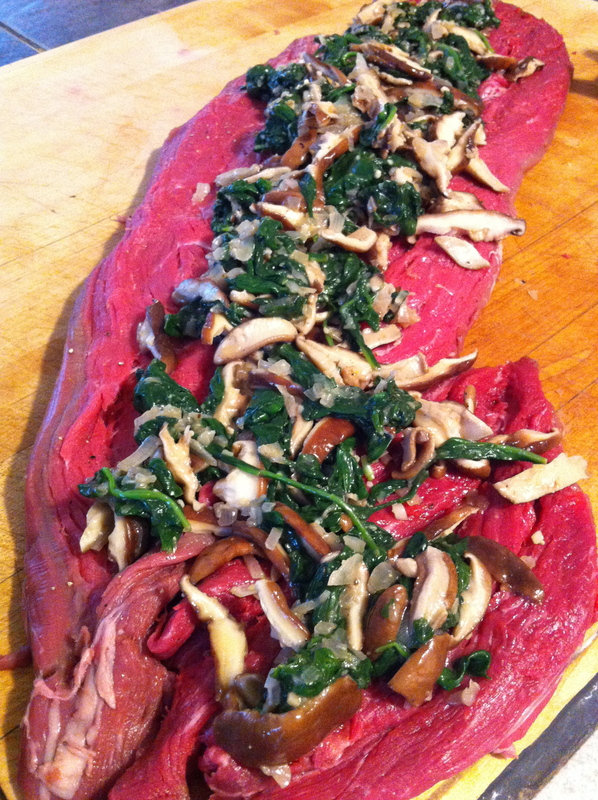 Spread spinach mixture down center of tenderloin to within ½ inch of sides, fold over 3 or 4 inches of small end. Toll up tenderloin jelly roll fashion, starting with the short side. Secure a 2 inch intervals with heavy string. Brush olive oil over tenderloin, sprinkle with salt and pepper. Place in broiler pan coated with cooking spray, cover and chill. Bake at 500 for 35 minutes or until the thermometer registers 145 (medium-rare) or 160 (med). You don’t want to over cook this cut of beef. Since it tapers at the ends those pieces will be more well done. Place tenderloin on a large serving platter, let stand for 10 minutes before slicing. Serve warm or chilled. Serves 8 or more depending on size of tenderloin. 35 minutes is usually fine even if thermometer does not register 145 degrees. 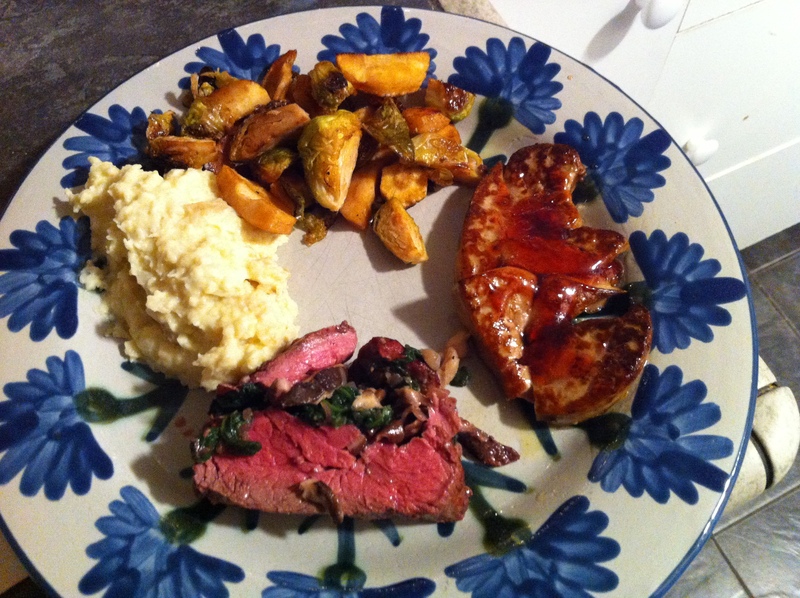 This entry was posted in Entrees, Family Favorites, PomPom Signature Dish, Recipes and tagged beef tenderloin, holiday meal, mushroom-spinach, stuffed tenderloin by skibootsinthekitchen. Bookmark the permalink.